If you dont have a sensitive stomach and is adventurous enough to enjoy street food in Jakarta, Jaya Agung Mutton Sate is one of the most famous sate houses that you must visit. Located next to the Djakarta theatre building right by the street side, they have been in the same spot since the 1970s. Jaya Agung is always filled with their regular customers who just canâï¿½ï¿½t get enough of their famous Mutton dishes. We must warn you though this place is very minimalist, and we donâï¿½ï¿½t mean it in a modern minimalist design way, but in a very ghetto way. If this is not your concern we highly recommend 2 of their most famous dishes the Mutton Sate and the Gule Kambing (mutton soup with various local spices). By far, their mutton sates are the largest cubes of meat we have ever encountered. Grilled in a traditional charcoal barbeque the lean and very tender meat is skewered with parts of fat as that makes this mutton sate very juicy and flavourful. It is served in a traditional sweet soy sauce and peanut sauce with a side of pickled shallots. Truly extraordinary! For those who are not a fan of mutton there is a choice of chicken dishes such as chicken sate and traditional Javanese soto soup. 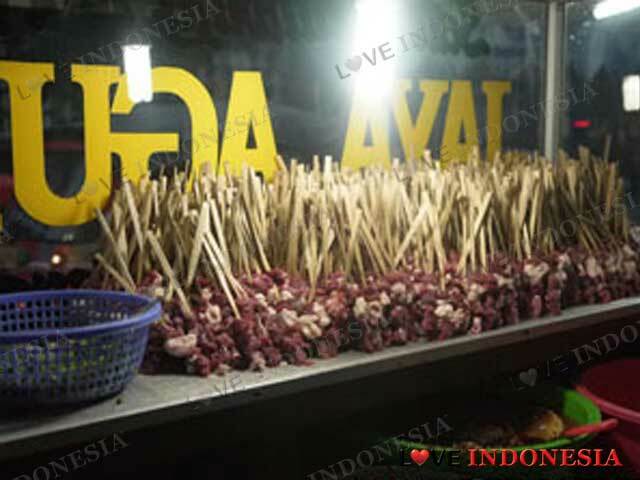 What is near "Jaya Agung Mutton Sate"?